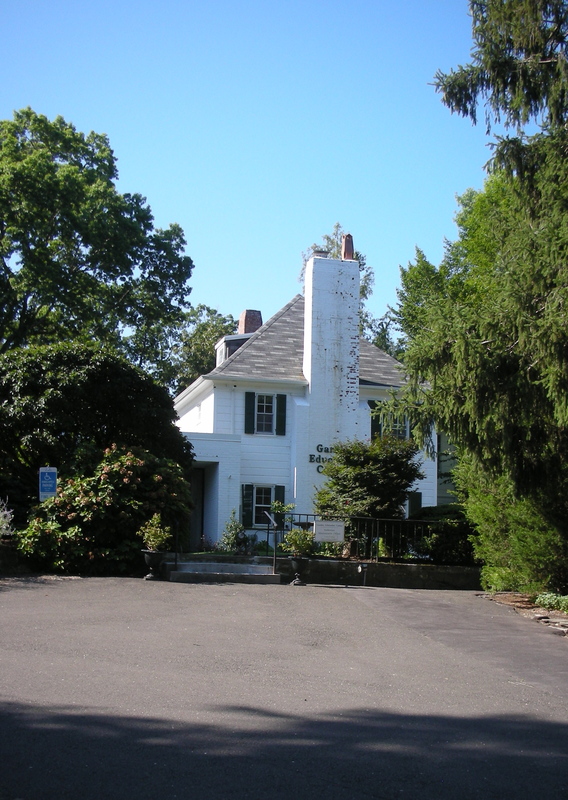 A morning at a workshop at the Garden Education Center of Greenwich was well spent. 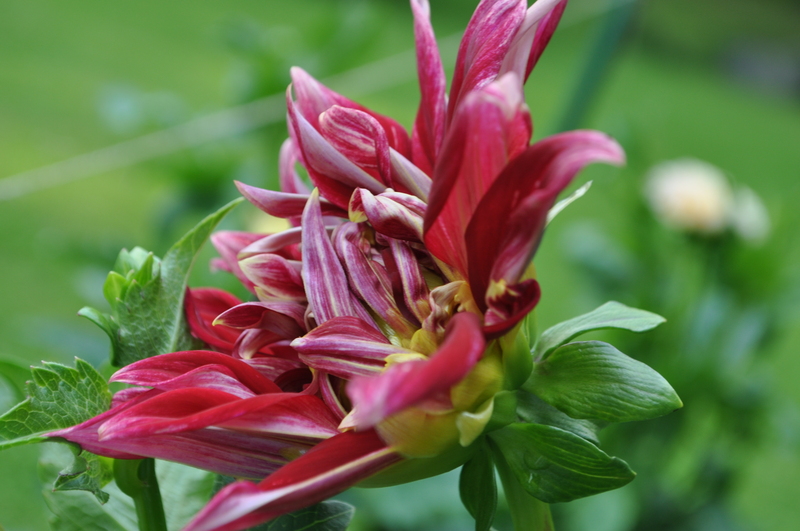 Tips and secrets on how to prepare dahlias for show with the added bonus of the materials to make a case to transport dahlias. 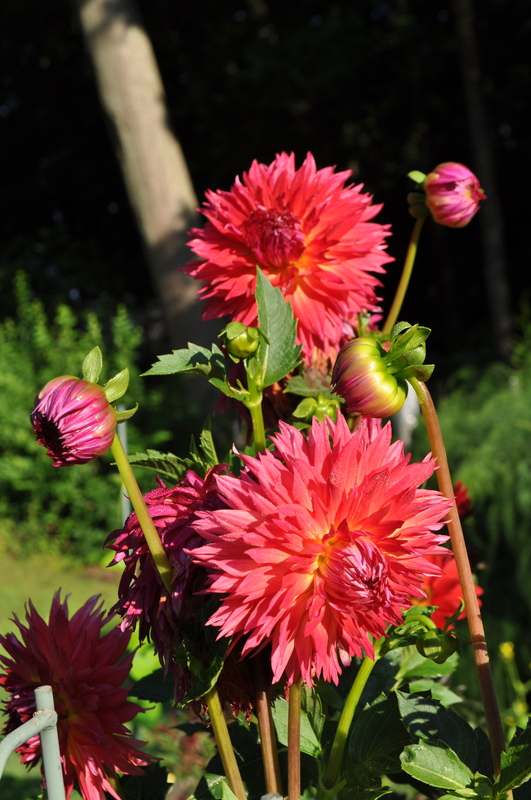 My dahlias are so happy after the recent rain, and with today’s weather, sunny and mild. 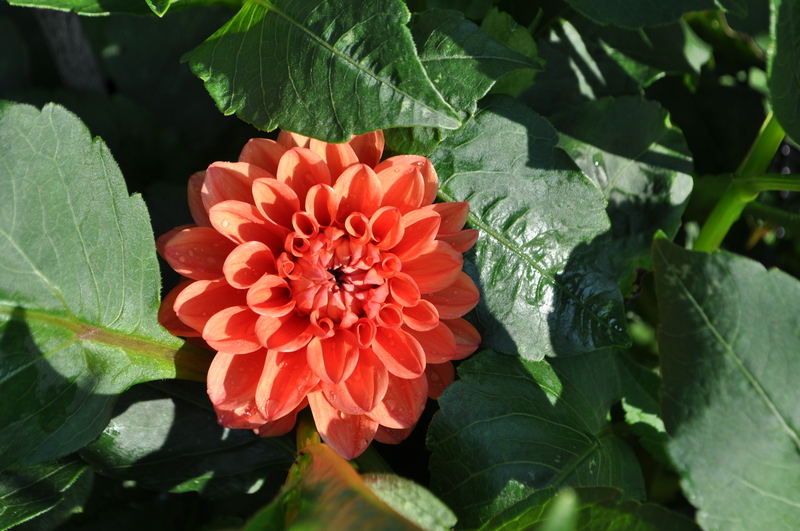 Evenings are cool, and the dahlias appreciate that. I’ve stopped the feeding but keep vigilant that they are getting enough water; dahlias are a very thirsty plant! They are beginning to show their appreciation. 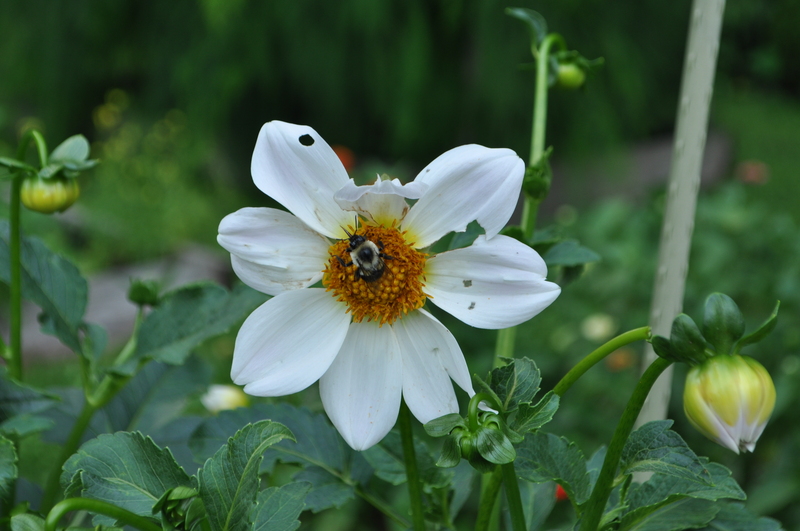 This particular white dahlia seems to attract more hungry insects and the damage is evident. Gregory Stephen is a surprise. Described in the catalog as “later in the season it will reward you with many 11-12″ blossoms. The flowers are well supported on a 4′ bush.” The blooms are large but have not approached those dimensions! And the bush is more than 4 feet, as I look this bloom in the eye at 5’7″! I purchased Brookside Snowball because of the picture and the description, ” “This 4 inch white ball is an outstanding show winner.” It is taller than the 4′ described, but all else about it is perfection. A few more dahlias for your consideration. A word of caution, this time of year – watch out for bees! I was attacked by an angry sort with a nest underground! The result was a trip to the E.R. and having my rings cut off – wedding band, engagement ring and another band! Very unhappy! The swelling is going down, but the pain was harsh for several days, only alleviated with a steroid cream and icing. Do not go out in the garden without your gloves! And be on the watch for bee activity!!! The afternoon was spent with my dear garden mentor. Almost the perfect Summer day! Sitting outside under a blue blue sky with her faithful Aussies by her side, we discussed plants and breathed in the perfect day. I cut her some flowers….coals to Newcastle, you might say. 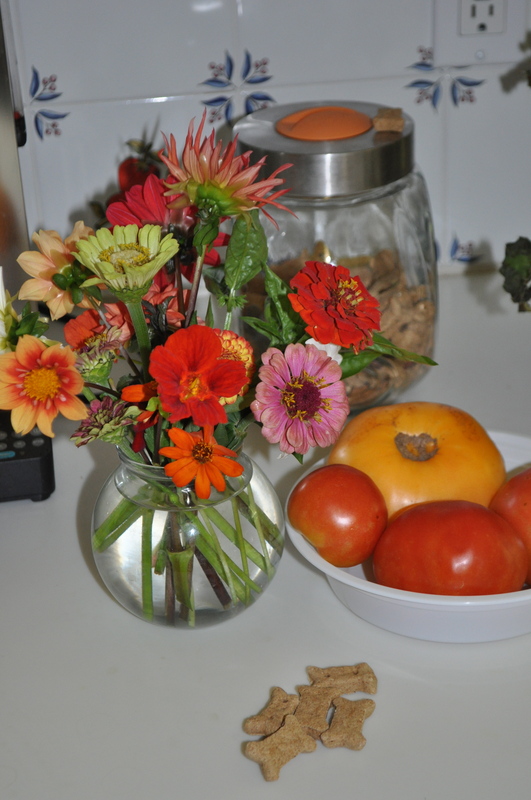 Some tomatoes…the critters have eaten hers. And, of course, biscuits for the Aussies. 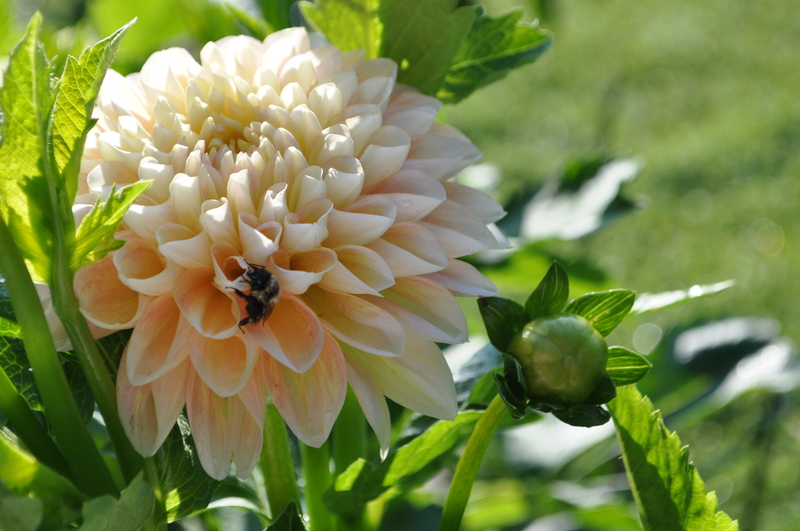 This entry was posted in Uncategorized and tagged bees stings, Dahia 'Brookside Snowball', Dahlia 'Gregory Stephen', Dahlia 'Honey Dew', dahlias, Garden Education Center of Greenwich. Bookmark the permalink. 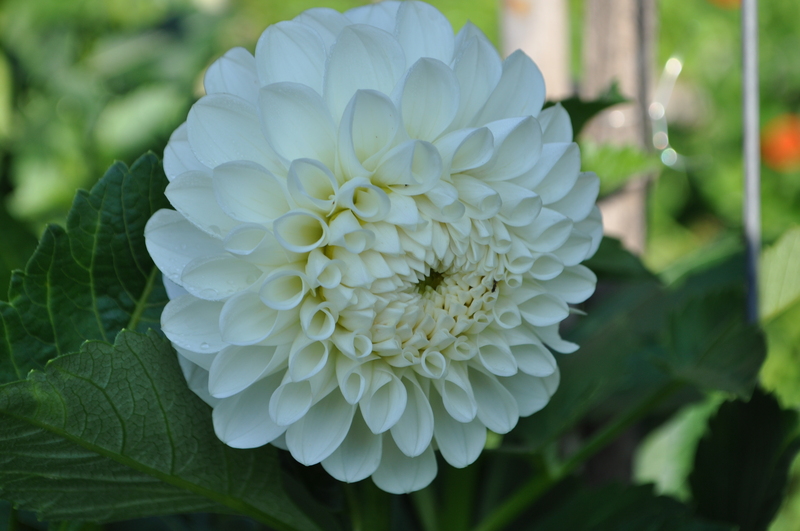 Love the Snowball dahlia – mine have been a bit disappointing this year. We have had badger problems in the garden and he trundled through my dahlia patch snapping off all the stems. Still, there is always next year. I love your positive attitude! I had a woodchuck early on but his disappearance has made all the difference! Thank you for reading the blog!